I provide consistent, high quality photographic work in a timely manner. If you’re a team looking for photos to give to your sponsors or to use on your website or if you’re a sponsor looking for a photo of your team please get in touch. I also provide spectators photos of their favorite drivers. 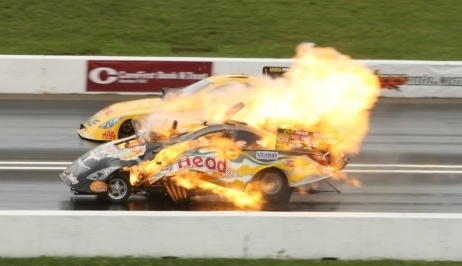 This photo is from May 24th at the semifinals of the NHRA Summer Nationals drag races. The driver Jim Head was not harmed by the explosion. All images are copyrighted and reproduction of these images is strictly prohibited.